Forum Description: Post your best screenshots here! My favourite plane, and to my surprise, I only had to do two repaints. All others exist already, but it comes at a price, because it means installing at least 4 different models. I even had to necromance the ancient PAI model. Those repaints will definitely be re-done at a later time. 1. http://www.tuocielo.ru/view_cat_model_en.php?cat2=tu154m&section=model" rel="nofollow - Tuo Cielo Tu-154 . This is by a huge margin the best model. It's also the newest. It coimes with an excellent paintkit, which however requires some serious experience with Photoshop. 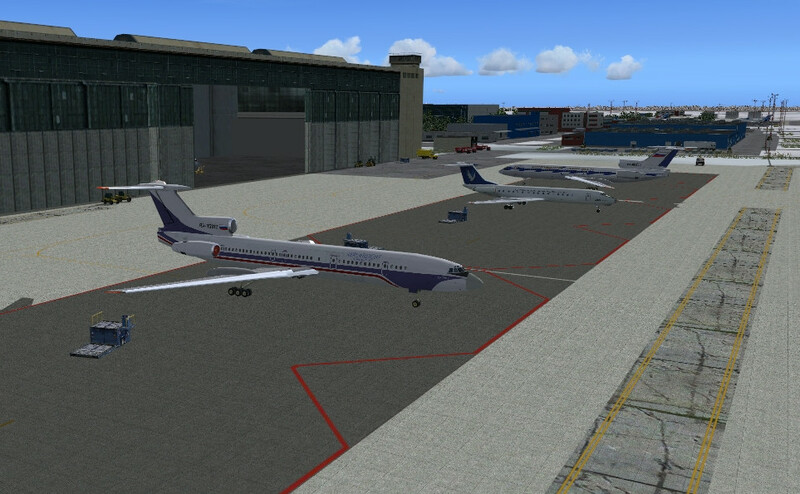 2. http://www.avsim.su/f/fs2004-ai-samoleti-dlya-trafika-48/simlndmrks-tu154m-traffic-2-5374.html?action=comments" rel="nofollow - Simlandmarks (Vala) Tu-154 . This has been the de-facto standard model for many years. It comes with a paintkit. However, the downside is that it doesn't distinct between M and B-2 models. It also uses the cumbersome alpha-channel method for mapping reg-numbers to the wings. 3. https://web.archive.org/web/20080311013647/http://homepage.ntlworld.com:80/sergs.skj/SKJ%20ActiveAITraffic/download_v3.htm" rel="nofollow - SKJ Tu-154 V3 . An excellent model which provides groundvehicles on the ramp. As a downside there is no paintkit for it, only a blank texture to create a poor-mans pk from. Does provide both major models in one installation. 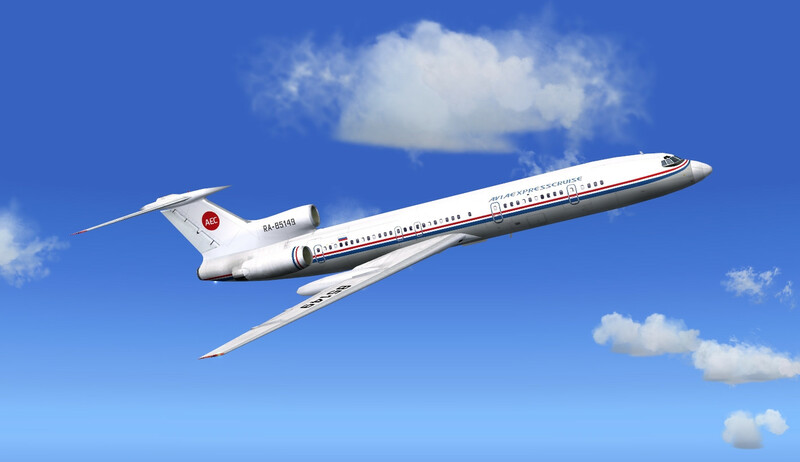 4. http://www.flightsim.com/vbfs/fslib.php?do=search&fname=ai154pak.zip" rel="nofollow - Viktor Schacht Tu-154 . An ageing model which was used before the Vala model was released. Needed that one for the Gazpromavia repaint. It provides both M and B-2 variants, but in seperate installs. No paintkit AFAIK. 5. https://web.archive.org/web/20060203024754/http://www.projectai.com:80/packages/fde.php" rel="nofollow - PAI Tu-154 . Pretty much the oldest model available and it looks its age. Needed that for the Shaheen and Kyrgyzstan repaints. Comes with a paintkit though. Provides both variants, but in separate installs. Not painted: Cyprus Airways. Why? Nobrainer. Cyprus never flew Russian metal. Upon investigation it turned out to be codeshare duplicates. The respective flights were already part of Aeroflot's schedule. In the end I only needed to do 2 repaints. I'll definitely redo the PAI ones and the Gazpromavia to get rid of the Schacht model. I'll present those at a later time in this thread. Number 1 is Aviaexpresscruise for the Vala model. Many of you might have seen this plane before, but with Aeroflot-Don titles. This shows that Russians didn't waste much money on painting their aircraft. When they bought a plane, they just panted over the previous owners name and scribbled their own one on it. This is why this plane still hat the China Southwest cheatline in 2003, and would still have it when entering service with Aeroflot-Don in 2006. Next in the pipeline is the Tu-154's smaller, screaming brother, the Tu-134. Would that be the SKJ demo Tu134 which has the black box above it ? Not sure what you mean? The SKJ Tu-134 doesn't have a demo. It's Freeware. Most of my 134 repaints are for the Mehlin Rainer and SBAI models, since the SKJ model has broken flight dynamics. Sorry. My bad. Just looked up what I had and I have the SBAI which was the only one I could find 2 years ago. I'll release a list of models with my Tu-134 repaints, which are coming tomorrow. There are seven different models around. Would it possible, for me to obtain from you, the repaints of the original Ultimate Traffic Schedule, you have covered i.e. 95% you said you had. How could that be done ? via email ? if that is okay with you ? It would be great if you could for me, P.S. very good repaints you have made here.